Vladimir Ilyich Ulyanov (later Lenin) was an ethnic Russian from the Russian hinterlands who hated Russia with a burning passion. They say that Old Russia was defined by three things: divinely anointed monarchs (tsars), the Russian Orthodox Church, and the Russian people. Lenin hated all of them, as did his elder brother who was hanged for taking part in the assassination attempt on the penultimate Russian tsar Alexander III. Lenin’s hatred of Russia and his desire to avenge his brother led him to design a rather far-fetched, but certainly diabolical plan to destroy her from the inside out. Considering that Lenin was the son of a school headmaster in a remote provincial city with no particular skills or education, undertaking the destruction of one of the world’s leading powers, an empire that had just celebrated the tri-centennial of the wildly successful (by any measure) Romanov rule, certainly bordered on delusional. But Lenin had a few tricks of his own. First, he cared nothing about sacrificing his own life for the cause. Second, he had a deep understanding of how Russia worked and as such he knew its weak points, and third, he was a tireless and extremely gifted organizer. The plan was hatched while Lenin was in exile in Switzerland, living off funds provided by the Russian revolutionary movement. Lenin knew that to accomplish his goal he needed to undermine the trust of the Russian peasant conscript army in the twin institutions of the monarchy and the church. Given the right set of circumstances and some help from Russia’s foreign enemies, this was the easy part. 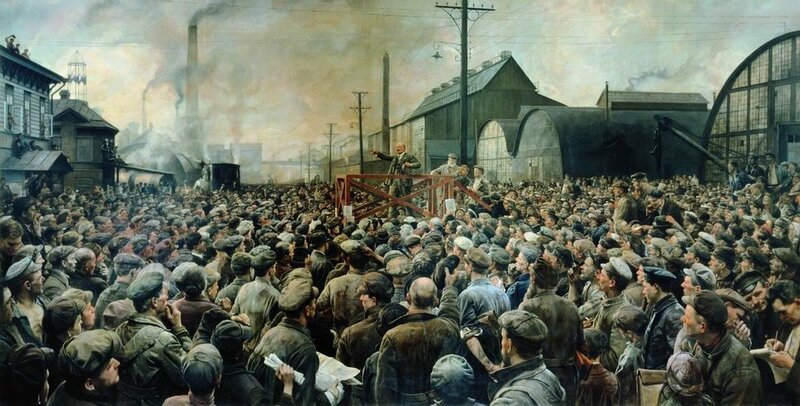 The difficulty arose in subverting the innate patriotism of the Russian peasant and factory worker. For that Lenin needed some help, which he found in the writings of the two early pioneers of globalist thought, Karl Marx and Frederich Engels. These two gentlemen, writing in the midst of the upheavals and excesses of late 19th century industrial revolution, redefined the battle lines from those between nation states to those between classes of people as defined by their socioeconomic standing. This change in paradigm suited Lenin to a tee. 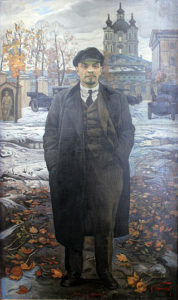 Being himself the son of a talented and hardworking teacher who rose through the ranks to become headmaster and was rewarded by a non-hereditary minor nobility title, Lenin was keenly aware of the natural resentment that Russian workers and peasants felt towards the so called “bourgeoisie”. Adopting as whole cloth the ready to wear ideological foundations laid by Marx and Engels allowed him to save time (as in any outsourced job) and more importantly to provide intellectual cover to those of the educated and affluent classes who were ready for a revolution, but needed an excuse to jettison their patriotic duties and feelings. Prior to the outbreak of WWI in 1914 Lenin’s plan was nothing but a gun without ammo; yes, there was ongoing upheaval in Russian society, and certainly the disastrous defeat in the Russo-Japanese naval engagement ten years prior had severely diminished the tsar’s reputation as the defender of the Motherland, but Russia had the fastest growing economy in Europe and was rapidly modernizing and expanding. The benefits, while still available only to the few, would soon be available to the masses. But then the dominos of the tangled European alliances started falling and Nicholas II, making the biggest mistake of his soon to end life led Russia into a war for which it was woefully unprepared. Fighting against the vastly better equipped Germans, Russia suffered from severe shortages in every kind of military materiel and reeled across the entire Western front. Casualties quickly mounted and news from the front was relentlessly brutal. 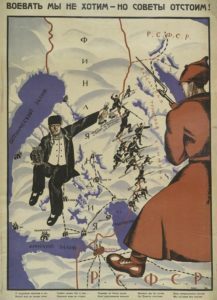 In early 1917, things were looking up for Russia and Nicholas. Russian factories finally caught up with production of guns and ammo, and Russian railroads were delivering these supplies to the front lines. Across the Atlantic, Woodrow Wilson perceiving that there were spoils to be had and that most of the blood had already been spilled, was making ready to join the fray. The Austro-Hungarian and the Ottoman Empires, the twin zombies of the old-world order were teetering. Germany, the main Russian enemy, was under increasing pressure. But the Germans had one ace left. Placing Lenin into a sealed railway car, they delivered him to the outskirts of Russia’s capital of Petrograd (St. Petersburgh). This was akin to injecting a patient recovering from a nasty bout of pneumonia with the HIV virus. 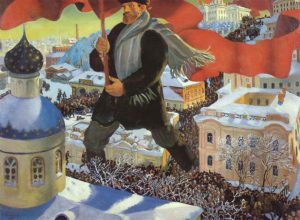 Quickly exploiting the fact that Russia’s positive reversal of fortune at the front had not yet reached the masses, Lenin seized the moment. Using his organizational skills and the agitation/propaganda (agitprop) skills of his collaborators in the Bolshevik section, he overthrew the temporary government with nothing but a few soldiers armed with rifles and bayonets. The dramatic nature of the Bolshevik coup d’état notwithstanding, it is what came next that provided the shock that is still so vividly felt today. Lenin, an ethnic Russian, surrounded himself almost exclusively by non-Russians. Two of his most influential deputies were Ioseb Jugashvili (Stalin), an ethnic Georgian and Leo Bronstein (Trotsky), a Jew. 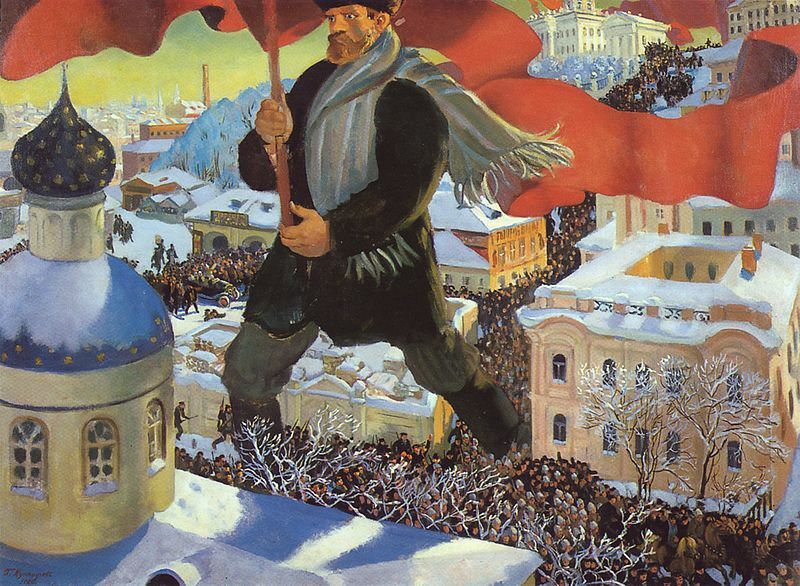 Following the coup and while the resulting civil was still raging, Lenin proceeded to eliminate all symbols of Russian ethnicity, sovereignty, and religion. Gone was the tricolor flag. Gone was the double-headed eagle. Gone were the Orthodox onion steeples with their distinctive crosses, all to be replaced by the new symbols of the hammer and the sickle, and the profiles of the three intellectual godfathers of the new Soviet state: Marx, Engels, and Lenin. The fact that two out of the three deities of the newly created nation were non-Russian and one was a converted Jew, was not coincidental. Lenin was both deliberate and ruthless in destroying anything and everything Russian. Russian peasants, who fed the Red Army during the civil war were brutally repressed, their lands confiscated. Enormous tracts of land, fought for and won by generations of Russian soldiers, were ripped from Russia and declared separate and equal “republics”. These included the most industrialized and productive parts of Russia such as the Ukraine and Belarus, but also Georgia, Armenia, and the Central Asian territories of Kazakhstan, Uzbekistan, Azerbaijan, and Turkmenistan. By ripping these territories, which in many cases were parts of the Russian Empire for centuries, away from Russia and creating the fifteen “republic” USSR, Lenin put in place a time bomb that finally exploded when the first globalist – communist experiment in actual governance collapsed under its own weight in 1990. These so-called republics, with the active encouragement of the victorious West, became independent countries, leaving Russia without its industrial and agricultural heartlands and with no access to a large portion of its energy resources. In fact, today’s Russia is the smallest it has been since the reign of Catherine II in early 19th century. To fully understand this outcome, one may think of the US as it was in the year 1800. Before the western expansion, before, the Louisiana and Alaska purchases. But that’s not all. Now imagine that these hard-fought battles and expensive purchases are reversed. Imagine that foreign and hostile powers have amassed land armies on your borders: the French in Louisiana, the Russians in Alaska, the Spanish in Texas and in California. Imagine that the US is now limited to its territories east of the Mississippi with Native American nations forming their own political entities in the West with full support from the European powers. Once we understand how that would feel, we can start the process of understanding why Putin cannot and will not choose to join the “good guys” club. The price of joining, the delegation of Russia forever to the status of second-rate power is too steep. If the road to recovering Russia’s preeminent status on the world stage leads through association and ad-hoc alliances with the pariah states of Syria, North Korea, and Iran, this is a price Russia is willing to pay, fully aware of both its short and long term effects. It is less clear that the lessons of the deadly poison that is the combination of globalism and communism have been learned in the West. On the contrary, many countries in Western Europe have embarked on a project of destroying their foundations of national and religious identities. In the US, the three pillars of the Constitution, the belief that individual rights trump pubic rights as enshrined in the Bill of Rights, and the belief in the transcendent power of the Almighty are under unrelenting attack by the mainstream media and the Democratic Party. Let Russia’s horrific past and uncertain future be a warning to all of us: globalism kills. Will 2018 Bring A Solution To The Dispute Over Macedonia’s Name?